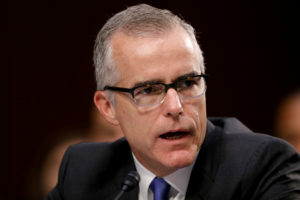 WASHINGTON — Andrew McCabe, the onetime FBI deputy director long scorned by President Donald Trump and just fired by the attorney general, kept personal memos detailing interactions with the president that have been provided to the special counsel’s office and are similar to the notes compiled by dismissed FBI chief James Comey, The Associated Press has learned. The memos could factor into special counsel Robert Mueller’s investigation as his team examines Trump campaign ties to Russia and possible obstruction of justice. McCabe’s memos include details of his own interactions with the president, according to a person with direct knowledge of the situation who wasn’t authorized to discuss the notes publicly and spoke on condition of anonymity. They also recount different conversations he had with Comey, who kept notes on meetings with Trump that unnerved him. Though the precise contents are unknown, the memos possibly could help substantiate McCabe’s assertion that he was unfairly maligned by a White House he says had declared “war” on the FBI and Mueller’s investigation. They almost certainly contain, as Comey’s memos did, previously undisclosed details about encounters between the Trump administration and FBI that could be of interest to Mueller. The disclosure Saturday came hours after Trump called McCabe’s firing by Attorney General Jeff Sessions “a great day for Democracy” and asserted without elaboration that McCabe knew “all about the lies and corruption going on at the highest levels off the FBI!” In the last year, Trump has repeatedly condemned McCabe as emblematic of an FBI that he insists is biased against his administration. Sessions said he acted on the recommendation of FBI disciplinary officials who said McCabe had not been candid with a watchdog office investigation. McCabe was fired two days before his retirement date on Sunday. The dismissal likely jeopardizes his ability to collect his full pension benefits and, more broadly, could add to the turmoil that has enveloped the FBI since Comey’s firing and as the bureau moves ahead with an investigation the White House has dismissed as a hoax. An upcoming inspector general’s report is expected to conclude that McCabe, who spent more than 20 years with the FBI, had authorized the release of information to the media and was not forthcoming with the watchdog office as it examined the bureau’s handling of the Hillary Clinton email investigation. McCabe has vigorously disputed the allegations and said his credibility had been attacked as “part of a larger effort not just to slander me personally” but also the FBI and law enforcement. McCabe, in a statement defending himself, asserted he was singled out by the administration because of the “role I played, the actions I took, and the events I witnessed in the aftermath” of Comey’s firing last May. The firing set off dueling tweets between Trump, who called the termination a “great day for the hard working men and women of the FBI,” and Comey, the director he fired 10 months ago. Also Saturday, Trump’s personal lawyer, John Dowd, cited the “brilliant and courageous example” by Sessions and the FBI’s Office of Professional Responsibility and said Deputy Attorney General Rod Rosenstein should “bring an end” to the Russia investigation “manufactured” by Comey. Dowd told the AP that he neither was calling on Rosenstein, who oversees Mueller’s inquiry, to fire the special counsel immediately nor had discussed with Rosenstein the idea of dismissing Mueller or ending the probe. McCabe became entangled in presidential politics in 2016 after it was revealed that his wife, during her unsuccessful run for state Senate in Virginia one year earlier, received campaign contributions from the political action committee of then-Gov. Terry McAuliffe, D-Va., a longtime Clinton friend. The FBI has said McCabe received the necessary ethics approval about his wife’s candidacy and was not supervising the Clinton investigation at the time of the contributions.